My Granny Murray was my Mam’s Mam, a fantastic lady who passed away early last year. We lived 50 miles of windy country roads from her house so a trip to Granny Murray’s was always an adventure, and since she didn’t see us all that often she would take the opportunity to spoil us with things she knew that we loved. If she knew we were coming there would be tart hot from the oven or white soda bread which we’d smother with jam. Sometimes we’d go up at short notice and she mightn’t have a drop of milk to give Mam in her tea but she’d root out a tin of Ambrosia Creamed Rice for us, lob in a dollop of strawberry jam and we were in heaven. One of our favourite treats that Granny used to make was “milk jelly”, simply jelly made on half milk, half water. Maybe lots of other families used to make this but I’ve never met one that does. 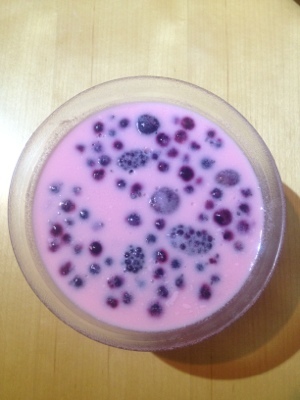 We loved that artificial creaminess, the pink colour and the richness that the milk gave to the jelly. I hadn’t ever made it for the boys but it came to mind at the weekend so we tried it out. I added frozen berries to posh it up a bit and make it blogworthy. It went down very well and when my back was turned the bigger one deftly divided what was left in the bowl between himself and his brother. And I remembered how much I had loved it and didn’t stop them. A word of caution: You’ve really got to keep this to raspberry and strawberry jelly, even lemon is pushing it but orange or lime, to my mind is stomach curdling. But we’ve all got different tastes I guess. It won’t win any culinary awards but it might win a few fans at your kitchen table, it certainly has some at mine. Break the jelly into chunks and dissolve as recommended on the pack in boiling water/microwave. Stir well and leave to cool in a jug. When cool (don’t rush or you’ll have a curdled mess on your hands) stir in the cold milk. Pour into serving dish or dishes and if you like add a few frozen berries. I did this time. Poor quality iphone pic as the camera wasn’t charged. Also, it doesn’t photograph well but I think that it’s evident that the the small lad enjoyed it. berries, desserts, easy, guilty pleasures, jelly, kids, recipes, Retro. Bookmark.